To use L2Connect, purchase licenses or services from our solution partners. In the cases where there are many small sites, a few large sites or where operation becomes complicated with mixture of sizes and number of sites. Experienced partners will support your configuration and operations. This is suitable for information system subsidiaries serving for its group companies to perform integrated VPN service management. Experienced partners in 24/7 operation supports security patch and fault handling. Apply for a free 30-day trial via our partners. On-premise free 30-day trial license is issued during the time period specified by the partner, after the application is accepted. Installation of L2Connect is surprisingly easy, and you can start immediately. Apply for a product license via our partners. 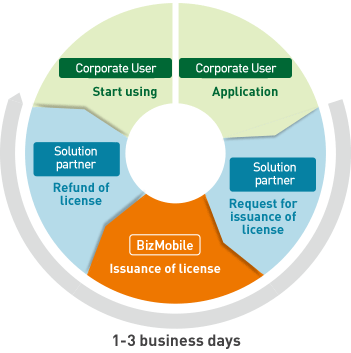 In BizMobile, the registration is completed in one to maximum three business days and a license will be issued. The necessary license and software can be obtained via a partner. In some cases, the pricing will be combined with the partner’s own product. Service (ASP) partners provide more secure and highly convenient services by combining our product with their own products and services. Therefore the pricing can be different. For details, please refer to L2Connect – Partners. Development of mobile phones authentication and location authentication function using GPS.